While the definition is flexible, a tiny house is generally thought of as a dwelling of 400 square feet or less. Some even come on wheels. Their small size and potential portability has led local leaders to wonder how to regulate them. In response, the Lancaster County Planning Commission created a planning tool designed to help municipalities address their concerns. 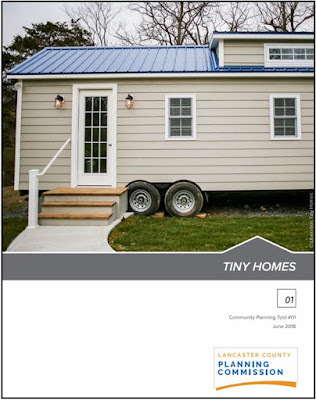 The tool, a packet available on the planning commission's website, provides a list of questions and topics for local zoning officials to consider when talking about tiny homes. One section points out that if a community already allows extraneous, additional housing units known as dawdy houses, granny flats, in-law units, ECHO housing or accessory dwellings, then it already permits some version of a tiny house. It asks whether officials would consider expanding their current ordinances if they already allow some form of tiny houses. “There was just some reality that tiny homes were out there and that municipalities need to begin to address them,” senior planner Gwen Newell said. Please do not include "Manufactured home" in the same category as a Tiny home or RV. Manufactured homes are constructed to be used as a single family dwelling and are constructed with many safety features that are not provided for in the other structures. Another development has started in Atlanta. Disruption in the recent news that the City of Fresno created the 1st CA. Tiny House Ordinance for Backyard placement for wheel trailer Tiny Houses. It can be built as a RV or Manufactured House format. This opens up other City/Counties to review their implementation to begin to avoid zoning with standard codes and practices exclusive to the site builders to offset the real need for affordable housing solutions. Site builders cost is much higher to duplicate and sell a similar square footage unit ans with their lack of sub-contractors to build them. They probably will remain outside this niche market. It appears they will stay within the over 2400 square foot house market. Steve L, although I appreciate your comments, once a "home" is certified as a "manufactured home" it cannot be considered as a "tiny home" as it is now a single family dwelling. As the one commenter stated do not include manufactured housing along with tiny homes, they are two separate products built to separate requirements. Also in PA new "certified" manufactured homes are exempt from the PA UCC, "Tiny Homes are not. They should not be discussed in the same forum.